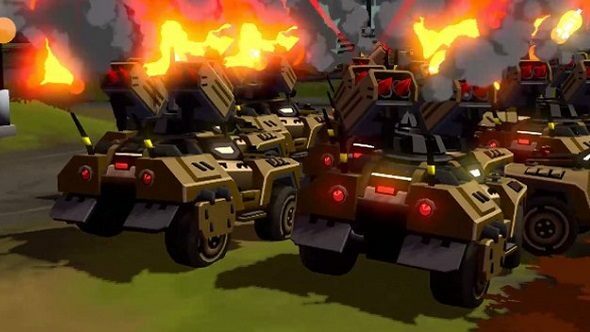 Petroglyph Games, the developers behind games like Grey Goo and Star Wars: Empire at War, announced earlier this year that they would be making a new RTS game called Forged Battalion. It features heavy unit and faction customisation, although back then, the only release date was a “Q1 2018” window for its Early Access period. Now, there’s an exact date for the game’s Early Access release: 16 January, 2018. Will Forged Battalion make our list of the 15 best strategy games on PC when it releases? That’s Steam Early Access, in case there was any doubt, and the Steam Store page is already live for you to take a look at. Announced through the news page for Forged Battalion, the game will have both single-player and multiplayer modes available at the Early Access launch, although neither will be fully fleshed out, as with all Early Access games. The reason why Forged Battalion is going into Early Access is because Petroglyph Games are looking for player feedback, as they want the game to support”a balanced competitive environment that is fun and rewarding for both new and veteran RTS players alike.” Given how Grey Goo made clear steps to try and make the RTS genre more accessible, it’s likely that Petroglyph Ganes will be doing something similar for Forged Battalion. There’s no price for Forged Battalion yet, and you can’t pre-order the Early Access version. It will, however, be cheaper in the Early Access period than at final release, and players will have a say in the game’s development.